Come September and apples come to market here on the prairie, we love to use them in desserts. Nothing says fall like an apple dessert be it a cake or a tart or a pie. We even like to take a favorite breakfast - German Baked Pancake and saute apples to top it with. For my Wednesday luncheon which had the flavors of fall I felt that there was nothing better than an apple cake -- a fresh apple cake. Full of chopped apples (and because there were guests I refrained from adding nuts) and middled and topped with caramel frosting. 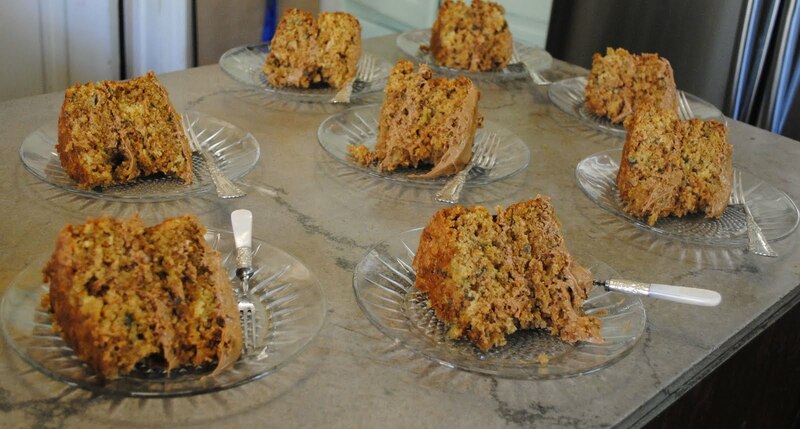 I love the look of all of the pieces of cake lined up in the kitchen waiting to be served. The cake was simplicity. And was so moist. I chose to use the frosting just between layers and on top -- I felt any more was just too much and therefore the sides were left bare. Measure oil into a large mixing bowl. Add sugar and eggs. Beat on low speed until creamy. Sift flour and measure. Sift again and add salt, soda and baking powder. Add a small amount of the flour mixture at a time to the creamed mixture. Beat well after each addition. When all the flour has been added or when batter becomes very stiff, remove electric mixer. Fold in chopped pecans and chopped apples with a wooden spoon. Spread evenly into a 9 x 13 pan (or 2 9" pans) lined with lightly greased wax paper. Bake in 350 oven for 45 to 55 minutes. Let cool in pan for 5 minutes. Carefully loosen edges and turn onto cake rack, remove wax paper, cool and frost. NOTE: I added a teaspoon of cinnamon and a half a teaspoon of nutmeg to the batter. Cook butter and sugar together until well blended and sugar is dissolved. Add 3 T. milk and 1 box of powdered sugar. Beat and add just enough milk to spread. NOTE: I didn't frost sides of the cake -- just used the frosting between layers and on top. It's Friday which means that it's Foodie Friday -- and it's good to be back in the kitchen!!!! Please join Michael at Designs by Gollum to see other tempting tasty fall treats this Friday. This cake sounds so great and I have a party to next weekend where I have to bring a dessert. This will be perfect! Thank you so much for this recipe!We returned from vacation and Ed's co-worker blessed us with a bag of aapples. . .just last night. . .Is it Saturday, yet? ? ? AND. .. another great recipe that I don't have to add cinnamon to (I'm allergic) You are such an amazing blogger! That looks like a keeper! Martha, Thank you for your kind remarks left on my blog. It is a work in progress and hopefully my photos will get better. That cake looks soooooooo good. YUM!!! Is there anything better than fresh apple cake in autumn? I do love caramel. In fact, I'm looking for a reason to make caramel apples. I love this time of year - I don't think I could every eat too many apple dishes. 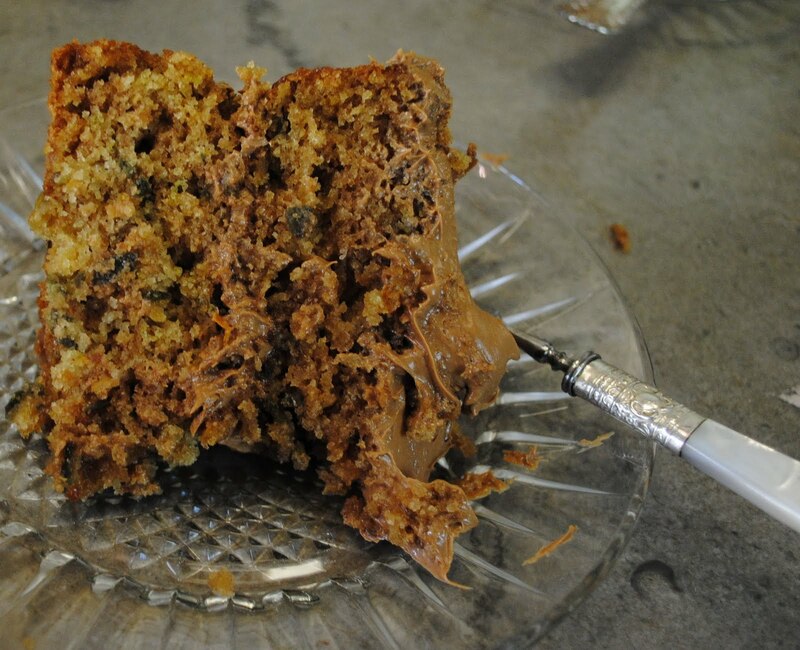 Yum, this cake looks so moist and delish. Thanks for sharing and i'm glad I stopped in. Martha .....this looks good. I must try this recipe. This cake reminds me of Autumn, one of my fave seasons. Glad you are doing better. Your right, putting a carmel frosting on that is a perfect combination! Looks delish. Looks delicious! Perfect for a coffee with the neighbors...which I will be having here next week. thanks for the recipe. I like to serve a cake alongside the pies on Thanksgiving, so I intend to add this to Monday's menu - thank you! Your Fresh Apple Cake with Caramel Frosting looks amazing. I will have to give it a try.